Happy Saturday to you! :) I had such a GREAT day. I scrapped all day long and laughed with some friends. Laughter is so good for the soul. A little break from all the stress was just what I needed. A fun card set with a different opening than "normal". 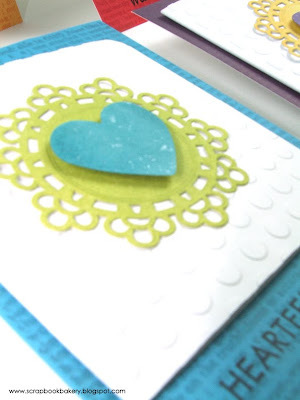 I dry embossed a small white card, embellished with the lace tag and heart and then attached it to a FLAT notecard so only the white part opens. Just mixing it up. Well, I hope I inspired you to do some creative play. I'm off to spend some time with my son and hubby. Have a great weekend! 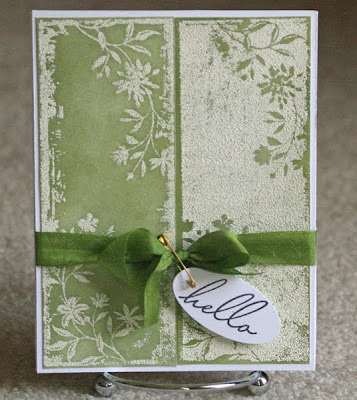 Cardstock: Bazzill Basics Paper (light and dark gray, lavender)Patterned Paper: Bella Blvd. 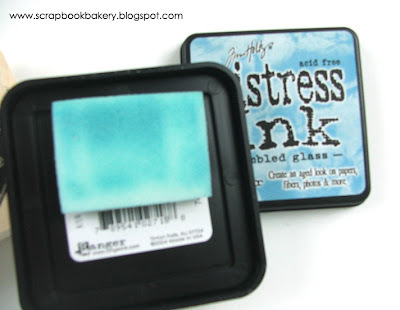 (yellow/gold paper covering swirl)Stickers: American Crafts Thickers (blue foam brackets), Chatterbox (green and orange "? 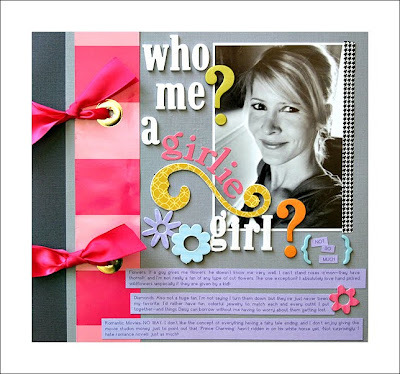 "s), Fancy Pants Designs (pink "girlie"), Michael's Stores (white foam/glittery), Pink Paislee (B&W artisan tape)Chipboard Flowers and Swirl: Making Memories Adhesive: Scrapbook Memories small adhesive squares (behind the blue flower)Hole Punch"
a closer look... 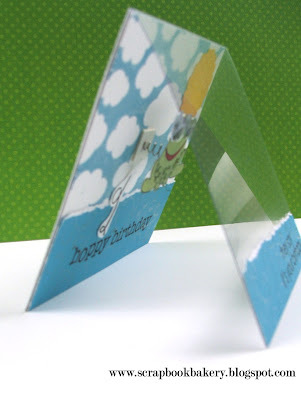 The next card was inspired by the product I used on it. 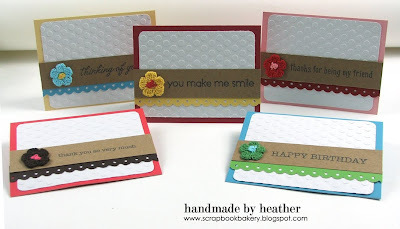 Quite often the product itself will get my creative juices flowing like this ribbon card set from Making Memories... All the ribbon looked so pretty lined up one right after the other so I did the same thing to the bottom half of my card. 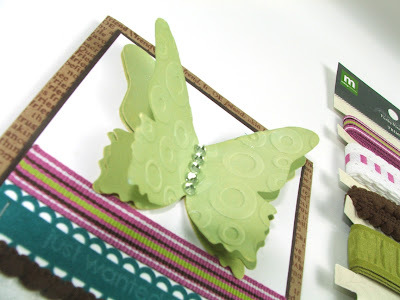 :) And I love how the butterfly turned out... To create this butterfly, I cut three butterflies out of white cardstock using a Stampin' Up die. 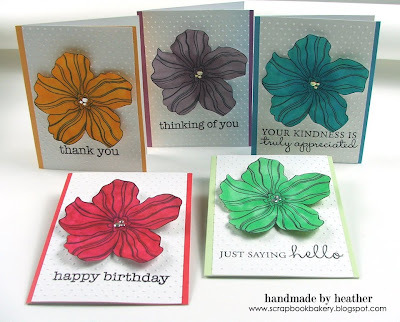 Then I inked each one with Shabby Shutters Distress Ink by swiping the pad across the image. Then I sprayed with pearlized water to give it some shine. 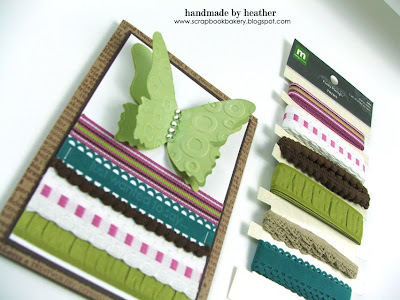 To finish it off, I ran the top butterfly through the Cuttlebug and embossed it. I layered them together (putting some foam dots in between to add dimension) and added some Hero Arts green gems to the center for the body. So, what inspires you? I would love to see. 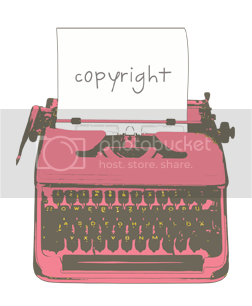 Live a link to a creation inspired by a picture or one of the inspiration pieces shown and you'll be enter into a drawing for a chance to win a prize at the end of the 30 DOI. 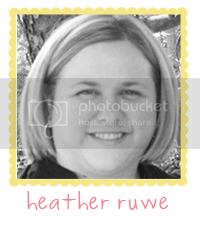 Can't wait to see your creations! Be back soon! Thanks for stopping by! As I mentioned in the previous post, I signed off and went to work on some more inspiration projects and completed one that's so fun that I couldn't wait to share. 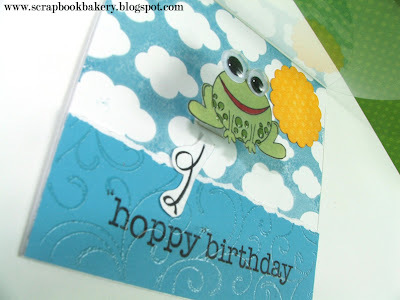 My mom's birthday is coming up and she is a frog lover. I was searching on Etsy and this caught my eye... You think it will fit my mom? LOL No, it caught my eye because it's ADORABLE! 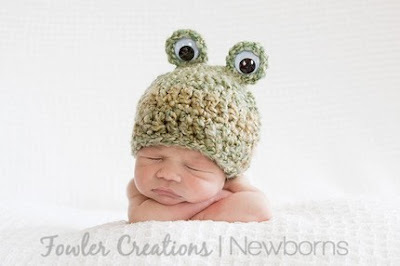 I've been wanting to have a baby for some time and I think that just pushed me over the edge! :) You can see more shots of this cute hat HERE. I typed out all the directions...you can find them HERE. Please leave a link to your creation in the comments section if you feel inspired! Hi! Back today with another project. 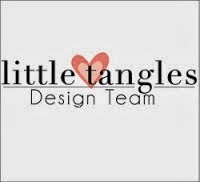 Remember THIS project? Well I still had some vinyl left and it inspired me to use it in a different way. 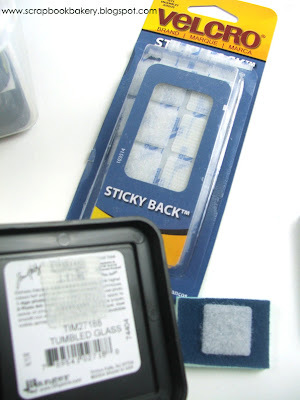 I recently purchased some of THESE in hopes of organizing some pictures on my computer. I finished it off with some tiny alphabet stickers from Making Memories. I wanted them to be pretty simple...they are for teenage boys! 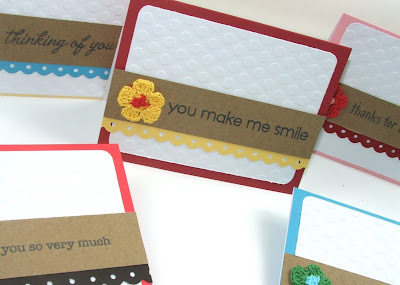 :) But you could add patterned paper to the front and embellishments! 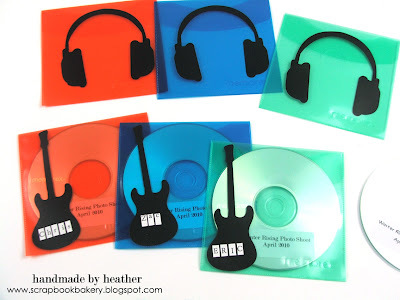 These would make great party favors! First, thanks for all the sweet comments from my last post. You guys are the best! I love reading your comments. Makes me smile. Here's my translation.... Both cards have gifts on the front. 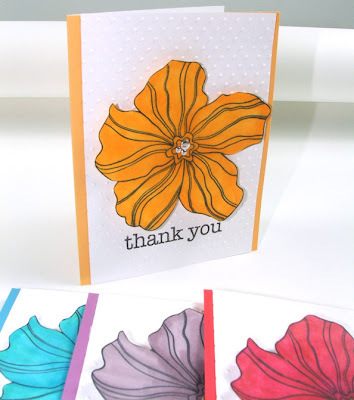 See that flower on the left card? It is a hair barrette made by attaching a shrinky dink flower (made from a large HA flower stamp) to a bobby pin. 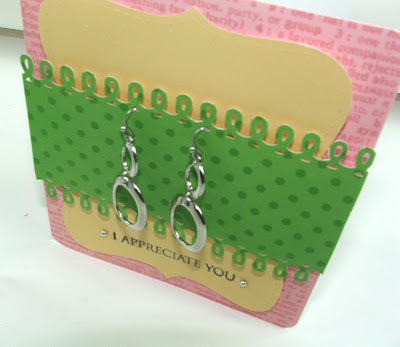 The card on the right has a pair of earrings hanging from the border punch I used. 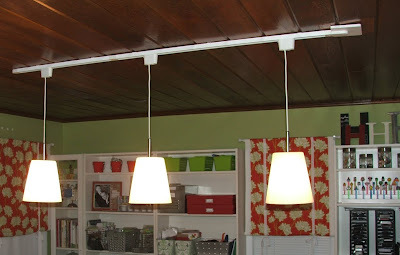 Wanted to show how I hung the earrings from the border punch...the recipient can just pull them out...no messy glue to deal with! 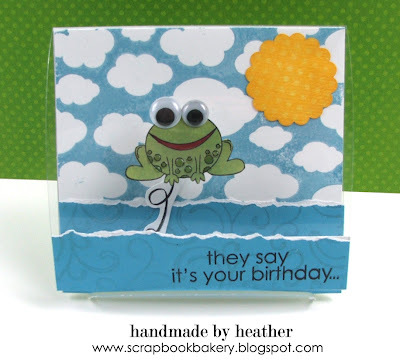 Leave a link to your creation inspired by any of the inspiration days. Would love to see your translation! Hi! Welcome back to the 30 Days of Inspiration. 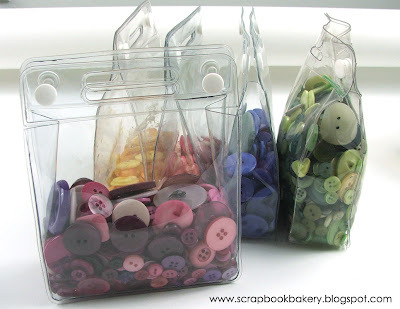 Today is Day 20 and I have a card set to share inspired by these.... A few bags of my buttons. I store my buttons in these clear bags that they came in when I purchased them. They came all mixed up but I've found it's so much easier to sort all of my embellishments by color. It really makes creating go faster. I'm no longer wasting time looking for the right color in a sea of other colors. 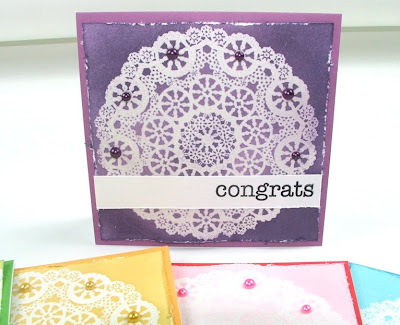 I created each card by stamping THIS stamp in VersaMark ink and embossing it with clear embossing powder onto a 4x4 sheet of white cardstock. 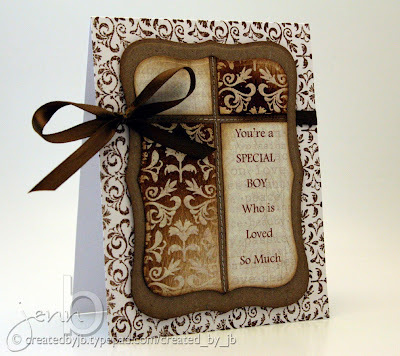 Then I took various distress inks (Dusty Concord, Shabby Shutters, Scattered Straw, Spun Sugar, and Tumbled Glass) and applied on top of the embossed image. 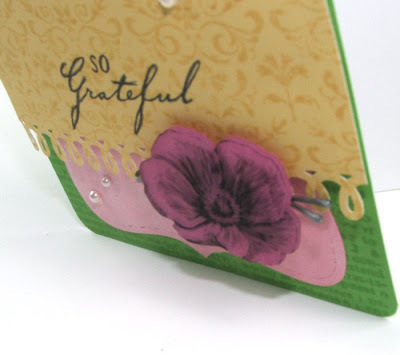 I distressed the edges, added a sentiment, and finished it off with some pearls and then attaching each square to some Hero Arts Notecards. 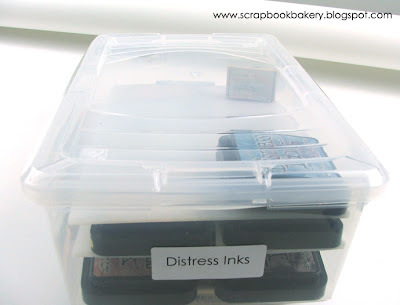 Next, I thought I would show you how I store and organize my distress inks. 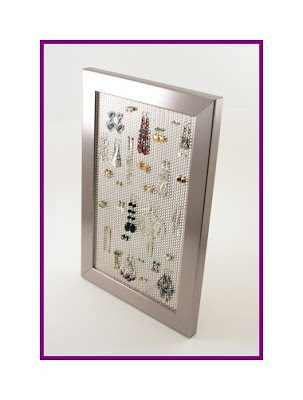 I have them in this clear shoe box that I purchased from Michael's (came in a pack of 4)... 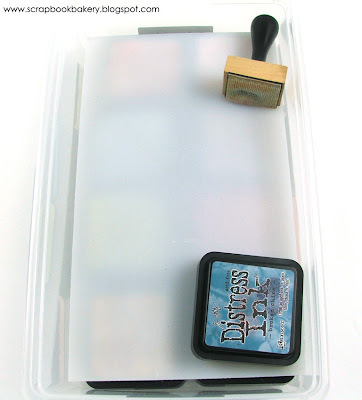 When you open the lid, you see my distress ink tool, a distress ink pad, and room for me to buy more inks!! :) They are sitting on a clear/frosted hard plastic that my sweet hubby cut down for me to create removable shelves inside the box-he is the best! When you remove the top "shelf", it reveals the next shelf of ink pads and underneath that, is the final few rows of inks... 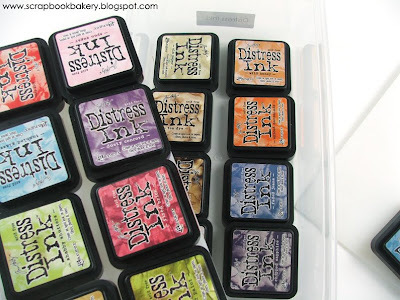 So in total you can fit 24 distress inks in there!! I mentioned on my last post that I went on an Ikea run to find some new lighting for my scrapbook studio. I was fed up with not being able to see what I was creating! 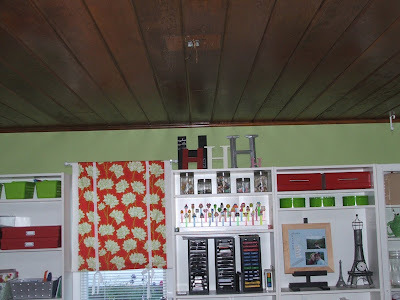 I think another reason I was afraid to change lighting is my studio is a room on top of the garage. It was converted from a screened in porch from the previous owner so no ventilation. It gets really warm in the summer and cool in the winter, so I thought the ceiling fan was a necessity for cooling it down...but I decided to get an air conditioner just for that room. Problem solved. I already worked in there a little tonight and I can't believe how much light makes a difference!I love it now! This has motivated me to share the whole room with you guys soon. I'm going to keep this short because I'm on my way to Ikea to get some lighting for my scrapbook room. 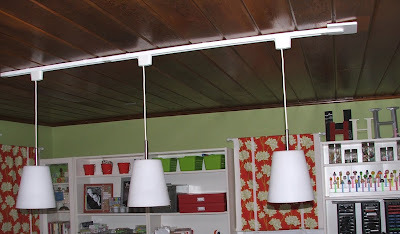 I finally decided to take down the ugly ceiling fan and get some modern lighting. I'm so excited! I'll have to share what it looks like when it's all done. 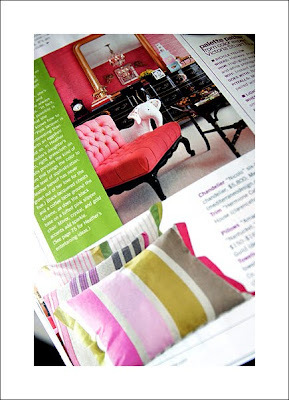 I'm also excited to share a project from another fabulous guest designer. 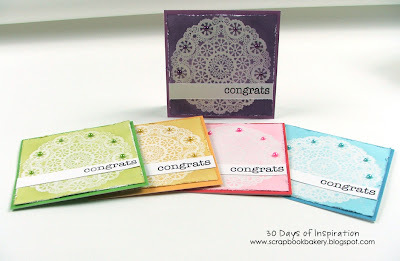 Jenn Biederman was nice enough to play along with the 30 DOI challenge too and I just love what she created. Her work always blows me away. Wow. Jenn always gives a warmth to her cards and this is no exception. Thanks Jenn for sharing with us. I'll be back tomorrow with another inspiration piece. Hope you can play along...just leave a link to your creation in the comments. Love those reverse image stamps. Thanks for playing along Jana. Feeling so blessed to have made such great friends with this hobby. Off to get some things checked off my to-do list. Have a great day! 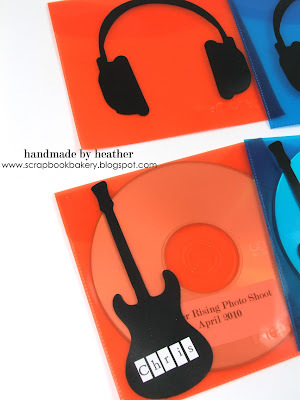 You might also like THIS, THIS, THIS, and THIS from Hero Arts. Don't forget to grab some ink too HERE. 4. I love KITS because everything is coordinated. I have some of my favorites back in stock, like THIS one that Laura Vegas worked with. You can find her projects with it HERE. Happy Shopping. I'll be back soon. Hope you had a great weekend!